Tap Photos on the Home screen to open it. Tap Photos at the bottom of the screen. The display of photos by year appears. Peruse you entire year of photos from this view. Tap the yearly photos and you see collections of photos by date. Tap a set of photo Moments displayed you can view the individual photos in that collection broken down day by day. 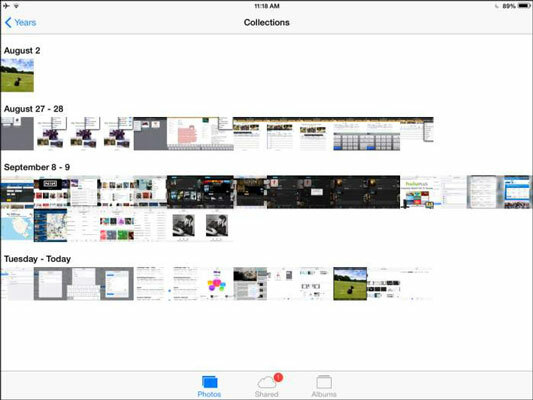 Tap Collections in the top-right corner to display photos by location. To go back to larger groupings, such as from a moment in a collection to the larger collection to the entire last year, just keep tapping the back button at the top-left of the screen (which will be named after the next collection up in the grouping hierarchy, such as Collections or Years).